Size A5 / 170 pages. Will be shipped within 48 hours after payment has been done. Price depend on area or address. This product will be shipped from Kuala Lumpur. Malaysian address RM 30; Southeast Asian address USD 15; Rest of the World USD 20. Two versions are available; spiral bound and perfect bound. So, unless you make a request, one of these versions (usually perfect bound) will be shipped randomly. All prices above are fixed. No need to pay for handling fee. No need to pay for shipping. No need to pay for GST (all are included). All methods of payment will be accepted. However, extra charge associated with the mode of payment will be paid by the buyer. Kindly note that in any case your money will not be returned, because I indeed ship a real product (your book) to you. So far, I have no problem with transactions since 2012, where I shipped to United States, United Kingdom, Australia, Austria, Germany, France, Finland, Italy, Spain, Japan (to name a few). If you need your book to be shipped with tracking number, just add EUR 3.00 (this is very cheap), and you must contact me when you intend to do this. 1) Annual Rankings. Many standard events has an average of TOP 30. However, some events has TOP 35 or TOP 40 or even more!. Additional events like half marathon also has TOP 30+ and other additional events such as 10km road, 10km race walk, 2000m steeplechase, 4x200m, 4x800m (to name a few) included short lists. Due to some demands, also included are the leading marks for events such as Octathlon, 3000m walk, 5000m walk, 4x200m, 4x800m (to name a few). In addition, leading marks for junior and category are also given in this publication. 2) All Time Rankings. Top 10 for standard events are included. 3) Major Meeting Results. Important results from SEA countries (i.e. National championships and National games) including full results of ASEAN University Games, and first three of SEA level competitions from all age-group competitions. 4) Statistical Profiles. 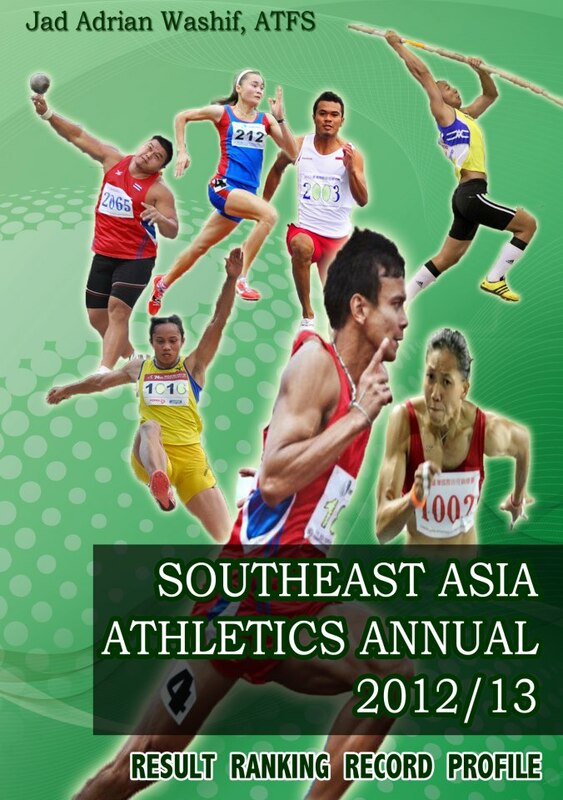 More than 100 athletes from all SEA countries including all top athletes from 2014 and those who are likely to be leading contenders in 2015 SEA Games. 5) Records. SEA seniors and juniors (all events). Outdoor and indoor records for seniors (standard events), with Asian and World records also included. 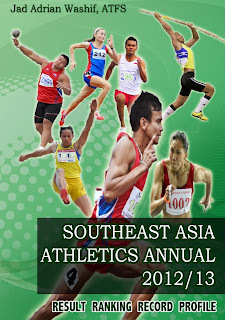 6) SEA Athletes in Asian Rankings. Analyses of SEA athletes who made top 30 of Asian rankings in 3 years (2011, 2012, 2013). Their positions in World lists also noted (if relevant). 1) Annual Rankings. Many standard events have an average of TOP 30. In stronger events like in sprints include even more. Men's 100m includes top 51. Weaker events (like throws) includes less than 25 performers. Many 'secondary' events like half marathon, 10km road, 10km race walk, 2000m steeplechase, 4x200m, 4x800m (to name a few) includes full or (mostly) shorter lists. Also included are leading marks for additional events such as 15km road, 3000m walk, 5000m walk, medley relay (to name a few). Also, leading marks for junior category given in this publication. 3) Major Meeting Results. Important results from SEA countries including full results of SEA Games. SEA level competitions for all age groups. 4) Statistical Profiles. More than 110 athletes from all SEA countries. 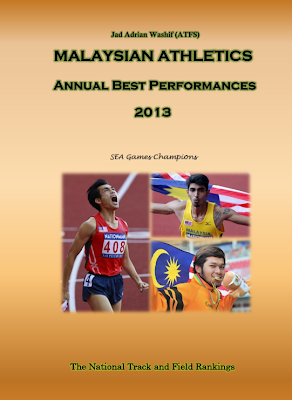 Including all SEA Games champions and World championship representatives, and other athletes who have produced best marks in 2013. Online transaction with PayPal is the safest, fastest, and easiest. You can send/receive money by PayPal account itself or by debit and credit card. But everything will be linked with PayPal account. However, there's an unavoidable fee in every transaction you have made. Starting from ??.? ?.2015 (will be informed without notice), buyer may pay the PayPal charge for the transaction made (EUR 1.00 only). Previously, I offer myself pay the fee for all transactions (through automatic deduction). Therefore, I suggest you buy now in order to avoid the PayPal fee. It will be EUR 16 & EUR 11 in the future. You may check out detailed calculation here. 2) All-Time Rankings. Top 10 for standard events. 3) Records. SEA Seniors & Juniors, National seniors (standard events) plus World and Asia. 4) Profiles. + 100 SEA's top athletes (incl. all Olympians from SEA countries)..
5) Results; AGP, AUG, National Championships, Road Races and other important meets. Payment by Debit / Credit Card, PayPal, Bank Transfer : contact compiler. "Kindly note that I've shipped the last publication to SEA countries, Australia, Japan, Austria, Germany, England, France, Finland, Spain, Italy, Sweden, USA and a few others... without knowing any problem"
The first ever statistics book with information of SOUTHEAST ASIAN ATHLETICS. 1) Annual Rankings. Indicating all NRs, and NJRs. Included also additional rankings such as "hand timing", "windy mark", "best athlete from other countries" etc. 3) Athlete Profiles. Leading athletes of SEA, incl. ALL gold medalists of SEA Games. 5) Major Meeting Results. SEA Games (full), Southeast Asian Juniors, Asean Schools, Thailand Open, Philippines, Vietnam , Singapore , Indonesia, Malaysia etc. Payment - all methods accepted. Extra fee (if any) must be paid by buyer. Contact the compiler by email.